A Level Physics is a challenging course but if you possess a deep interest in how things work then it is also immensely rewarding. You will study the physics of the smallest particle, the galaxies and the universe itself. A Levels simply do not get bigger in scope than this one. In the first year you will learn about particles, quantum phenomena and electricity, as well as fundamental particles, from protons to photons, this is always an exciting part for new students and underpins what you do next. The next topic is quantum phenomena where you will enter the world of the small and the weird! We will explore electricity where you will learn about circuits, how we use electricity, explore electrons and ions, and consider how we have been making electricity work for us since 1887. Topics in the second year include fields and further mechanics, looking at imaginary lines of force that apply across the entire universe, how they work and why they are so important, and explaining all types of motion. You will also study nuclear, thermal and cosmological physics. As part of the course you will visit the particle research centre at CERN in Geneva. GCSE Grade 6 or above in Physics and another science or two Grade 6s or above in Combined Science. Plus GCSE Grade 6 or above in Mathematics. Given the fundamental underpinning of maths, you will need to take A Level Mathematics alongside Physics. 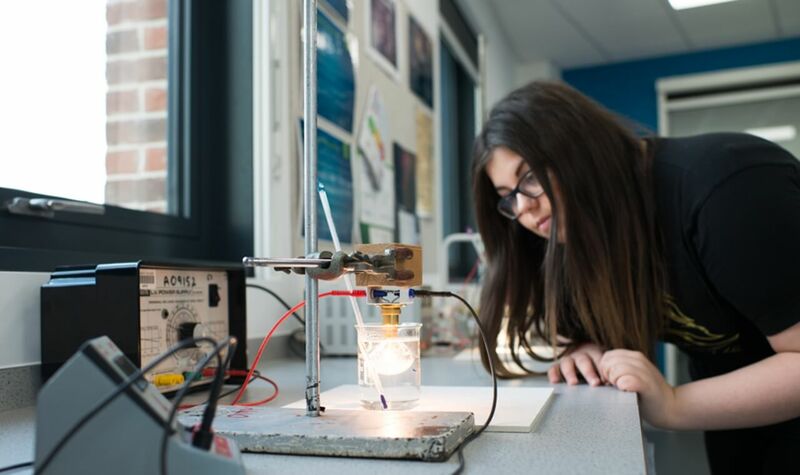 Studying Physics can be a springboard to a number of careers and you could progress into higher education to study astronomy, dentistry, engineering, forensic science, medicine, sound recording, veterinary science or finance. Career possibilities include architect, biotechnologist, communications worker, computer technician, electrician, energy sector worker, engineer, medical physicist, patent lawyer, science journalist or teacher. A Level Physics shows a university admissions tutor, or an employer, that you have a keen logical mind and are mathematically very capable, both skills that are highly sought after. Jonathan has a BEng degree in Electrical and Electronic Engineering from the University of Leeds and has been teaching for 24 years. He also has a PGCE (Science) from Bangor University.